In figures released by charity Ditch the Label in their latest bullying survey, 1-in-2 young people have experienced bullying, with 1-in-10 having been bullied within the past week. In addition, their research revealed that young people feel that social networks are not currently doing enough about online bullying, with many feeling unsafe online. Empowering pupils to take the lead on tackling bullying can help in schools, and participating in the forthcoming anti-bullying campaigns taking place next week can help enforce the message. Stand Up To Bullying Day was started in 2016 by The Diana Award with HRH The Duke of Cambridge and aims to raise public awareness about bullying and its long term effect, create understanding about our collective role in tackling bullying and to empower the public with the tools to stand up to bullying; wherever they are. Whether you're looking to support on social media, run a session in your school or review your anti-bullying policy there's plenty to get you going. Schools can download a resource pack with ideas for activities and fundraising events to support anti-bullying and the Stand Up To Bullying campaign. There is also a Thunderclap where schools can show their support. Stop Cyberbullying Day was founded by The Cybersmile Foundation on June 17th 2012, to promote online positivity and good digital citizenship. Since then, every year on the third Friday in June, Stop Cyberbullying Day has become a growing force of positivity. Stop Cyberbullying Day encourages people around the world to show their commitment toward a truly inclusive and diverse online environment for all – without fear of personal threats, harassment or abuse. 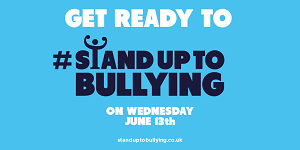 To get involved you can use the hashtag #STOPCYBERBULLYINGDAY on the day with your content (images, videos, articles) to let people know you are participating on Twitter, Facebook, Instagram and YouTube - supporting a brighter, kinder internet. Schools can also sign up to pledge their support via the Thunderclap campaign leading up to the day. Our sister site, Safeguarding Essentials (incorporating E-safety Support, offers resources to tackle bullying and cyber bullying. Join the FREE Membership service for the bullying assembly resource. E-safety Support members can also download cyber bullying specific resources and distribute Internet safety training. Safeguarding Essentials members have access to the full suite of cyber bullying and bullying resources including policies, teaching resources and staff training. Find out more.